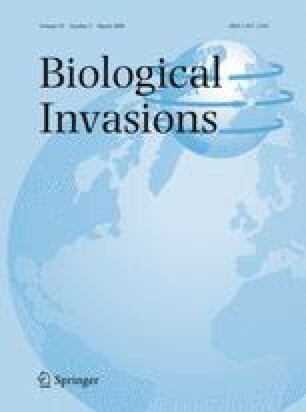 The evolution of increased competitive ability (EICA) hypothesis predicts that release from natural enemies in the introduced range favors exotic plants evolving to have greater competitive ability and lower herbivore resistance than conspecifics from the native range. We tested the EICA hypothesis in a common garden experiment with Sapium sebiferum in which seedlings from native (China) and invasive (USA) populations were grown in all pairwise combinations in the native range (China) in the presence of herbivores. When paired seedlings were from the same continent, shoot mass and leaf damage per seedling were significantly greater for plants from invasive populations than those from native populations. Despite more damage from herbivores, plants from invasive populations still outperformed those from native populations when they were grown together. Increased competitive ability and higher herbivory damage of invasive populations relative to native populations of S. sebiferum support the EICA hypothesis. Regression of biomass against percent leaf damage showed that plants from invasive populations tolerated herbivory more effectively than those from native populations. The results of this study suggest that S. sebiferum has become a faster-growing, less herbivore-resistant, and more herbivore-tolerant plant in the introduced range. This implies that increased competitive ability of exotic plants may be associated with evolutionary changes in both resistance and tolerance to herbivory in the introduced range. Understanding these evolutionary changes has important implications for biological control strategies targeted at problematic invaders. We would like to thank Yao Huang, Lianggang Zong, Yanyu Lu, and Shutao Chen for their help in collecting S. sebiferum seeds in China, and maintenance of the experimental garden. This study was supported by the US National Science Foundation (DEB-0315796) and by the USDA (2003-35320-13498).